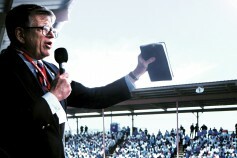 As 2012 winds up, I am pondering the departure this year of many Christ-followers, including our brother Chuck Colson. As I shared in a post after Chuck’s death, I have the highest regard for him. He was one of my heroes. Many of his books, including Kingdoms in Conflict, had a profound effect on me. I’ll never forget years ago when we crossed paths at a booksellers convention and Chuck stopped because he wanted to talk with me. He was late for an interview, but just wanted to share his heart and see how I was doing. I was deeply touched. He sent me many personal notes over the years, and kindly endorsed several of my books. Far more importantly, he was used of God to reach countless people for Christ, especially prisoners. Once while visiting Trivandrum, India, Chuck Colson was taken to a camp with more than a thousand inmates, most of them “untouchables.” Caged in squalid holes, with no toilets or running water, they were totally dehumanized, treated as outcasts. Speaking through a Hindi translator, Chuck shared his own testimony of grace and forgiveness. After the closing prayer, acting against the advice he had been given, he jumped down from the platform and ran to touch the men before him. Later, he wrote about this event: “Suddenly, like a flight of birds, men rose to their feet and circled around me. I shook every hand I could. Most of the men just reached and touched; they were desperate to ‘touch,’ to know that the love God offers is real.” Later, they went back to their grim cells. But that night, through the witness of Chuck Colson, they had received some good news: in Jesus Christ there are no untouchables. All of us bear that message whenever we walk the thin edge of costly discipleship. I can’t wait to see Chuck again, in the presence of Jesus. And I look forward to meeting many others, including his personal hero William Wilberforce, and C. S. Lewis, who wrote Mere Christianity, the book through which Chuck came to faith in Jesus. In fact, while they were all out of my league on this earth, on the New Earth I’d like to have lunch with Wilberforce, Lewis and Colson—and countless names unknown to me but well known to their Lord and Savior. And the King will answer them, “Truly, I say to you, as you did it to one of the least of these my brothers, you did it to me” (Matthew 25:40). Today’s guest blog is from writer Jill Kandel. Jill has been teaching journal writing to female inmates at a local jail for almost two years. 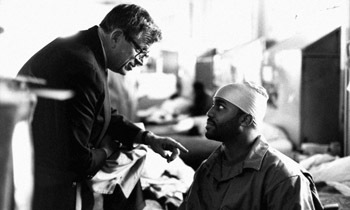 Last Saturday afternoon, Chuck Colson went home to be with the Lord. After founding Prison Fellowship in 1976, Chuck ministered in more than 800 prisons, in 40 countries around the world, over the next 35 years. Throughout the 21 years of EPM’s existence, we’ve received countless encouraging letters from readers, sharing how God has used Randy’s books to inspire them to live in light of eternity. But some of the most touching letters we’ve received are from a specific group of people: prisoners.